SKU: AA00278. Categories: CORPS, Hydratant & Nourrissant, Soin Visage. A silky and light serum specially formulated to help the eye area look younger. 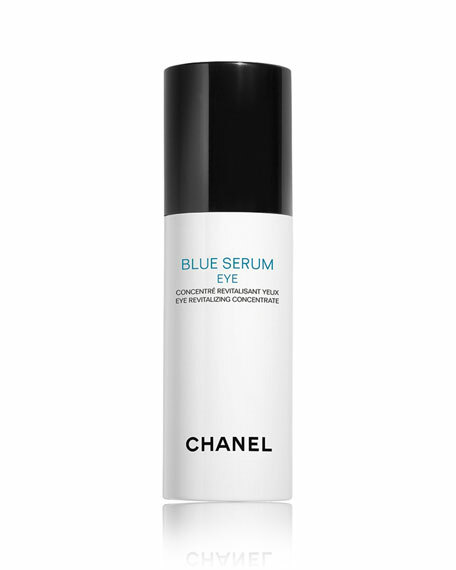 BLUE SERUM EYE increases hydration by 54% * and firmness by 24% **. The appearance of dark circles is reduced by 14% ***. Inspired by the regions of the world where people live longer, CHANEL Research has extracted ingredients from the longevity of diets in these regions in a revolutionary skin care. Increased antioxidant properties – up to five times higher than raw coffee oil with CHANEL Research’s proprietary technology – help protect the complexion. Essential fatty acids and fortifying polyphenols for the skin help to protect the skin. The patented Oleo-Eco-Extraction process delivers their most powerful properties. Natural oleanolic acid helps strengthen the skin’s natural healing abilities. Purified by supercritical CO2 extraction, these molecules provide optimal protection for the skin. Apply morning and evening to cleansed skin, before or instead of your usual eye cream. Follow with BLUE SERUM Revitalizing and your regular care ritual. * Instrumental evaluation of 22 women after 30 minutes. ** Instrumental evaluation of 21 women after one month of use. *** Clinical evaluation of 21 women after one month of use. **** Mastic gum: exclusively harvested in Chios (PDO); traditionally eaten in Ikaria.